– Turn on/off the energy saving mode. 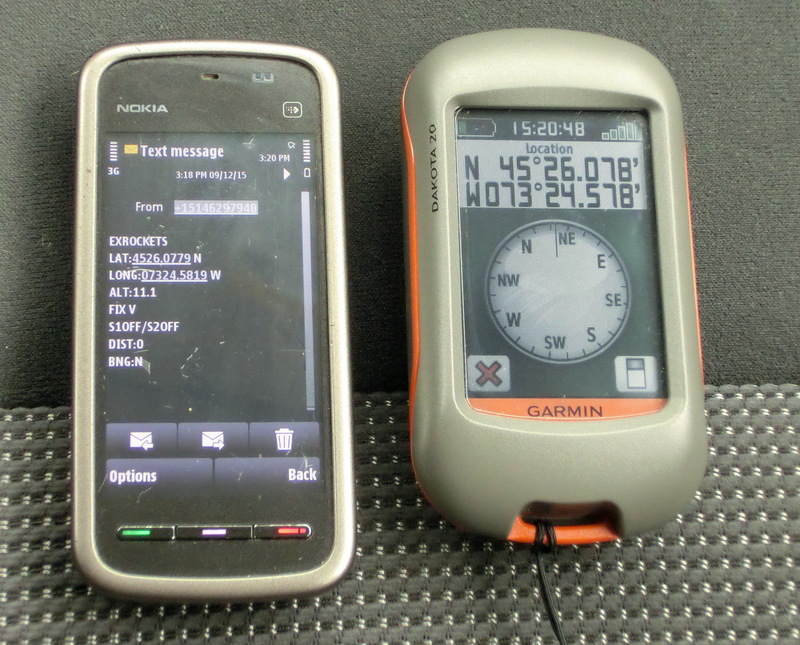 When enabled AND the SMS frequency is more than 45 seconds, the GSM module will be switched about 20sec before the SMS period and switched off right after the message was sent. 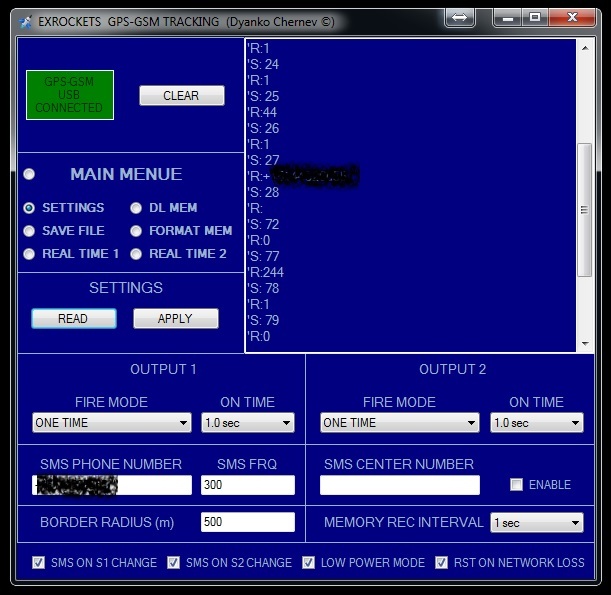 This will save a considerable amount of energy, the drawback is that during the off period no SMS commands can be received. *Still crossing the border radius or change on S1 or S2 (if enabled) will force the module out of sleep and will send the status message. – Turn on/off the reset on network loss function. If the network has been lost, the MCU will reset the GSM module. This is useful if fast switching between GSM networks is required or the network signal is weak and the module often drops. However if no other network is present then the module will keep restarting which draws considerable amount of energy. – There’s no real need to clear it before each trip as old data will be overwritten. 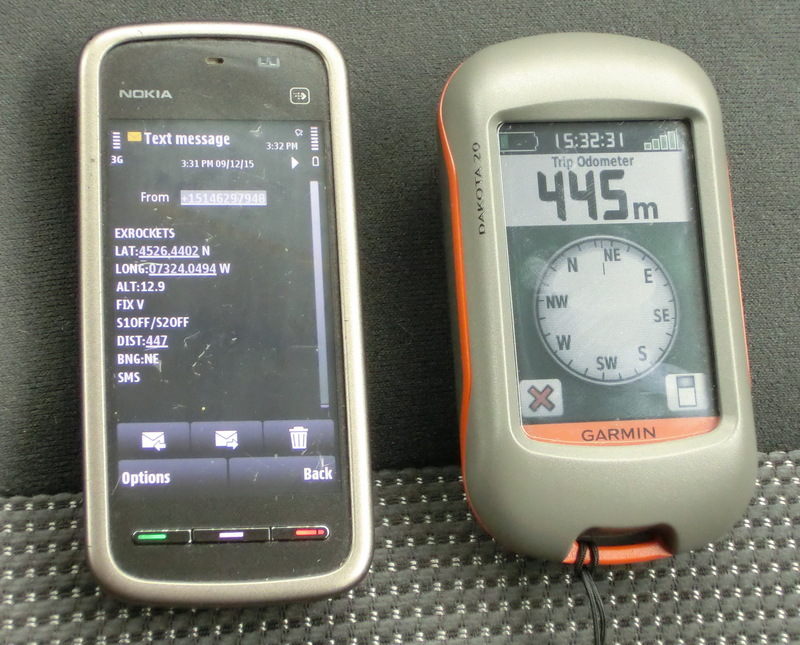 – The current GPS coordinates are decoded and transmitted in real time in short format i.e. Latitude, Longitude and Altitude only. 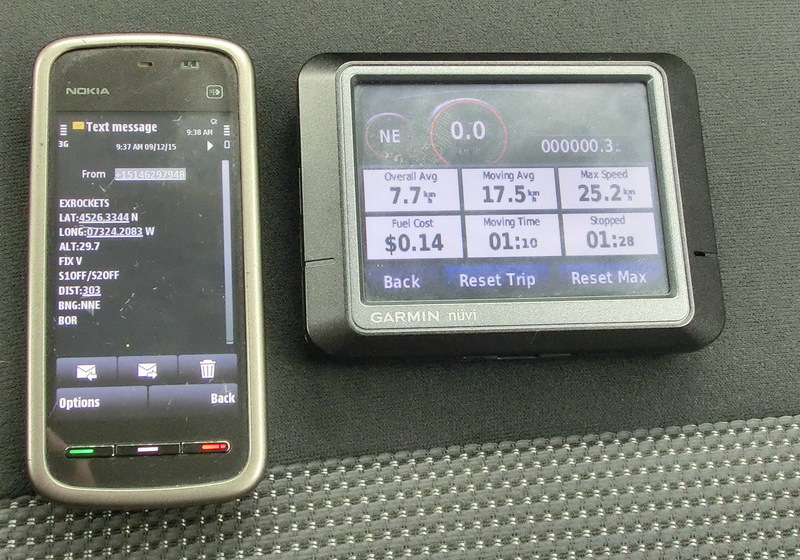 – The current GPS information is transferred in real time without any post processing i.e. 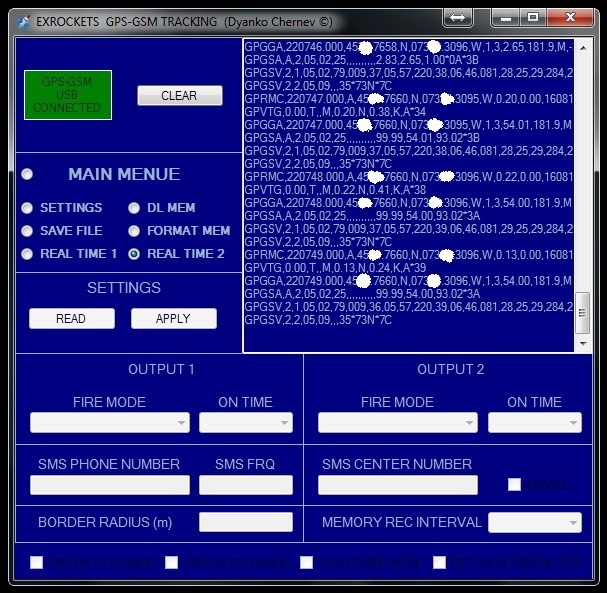 all NMEA messages are shown. 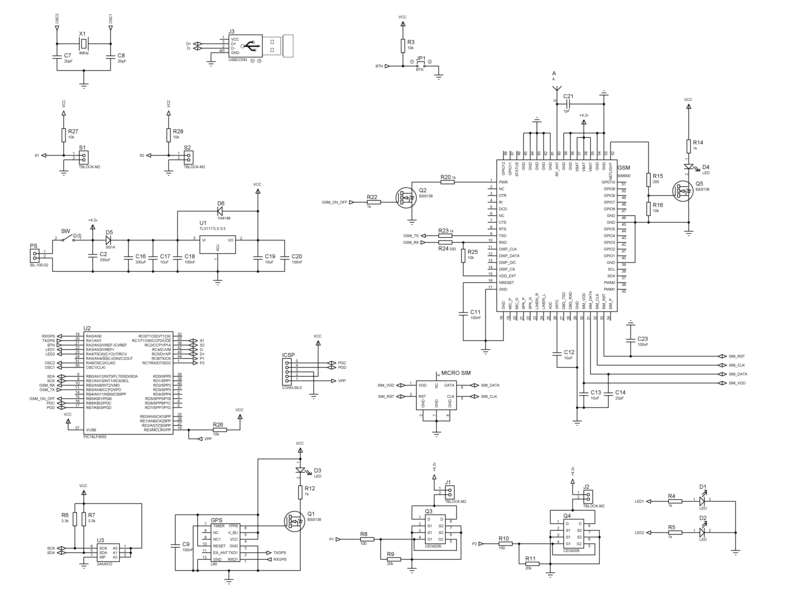 The schematic itself is very straightforward and corresponds to the datasheets of the modules with the two remarks that I will explain further down. Each logic input has pull-up resistor that allow it to be used as simple wire or breaker sensor. So one pin of the terminal block has low current 3.3 volts and the other pin is connected to ground. Hence if you connect a thin wire between the two pins on the terminal block and you break the wire this will change the logic state and message will be sent (if this option is enabled). Respectively if the connection between the two pins is open and you close it then this is again change in the logic state and message will be sent (if this option is enabled). 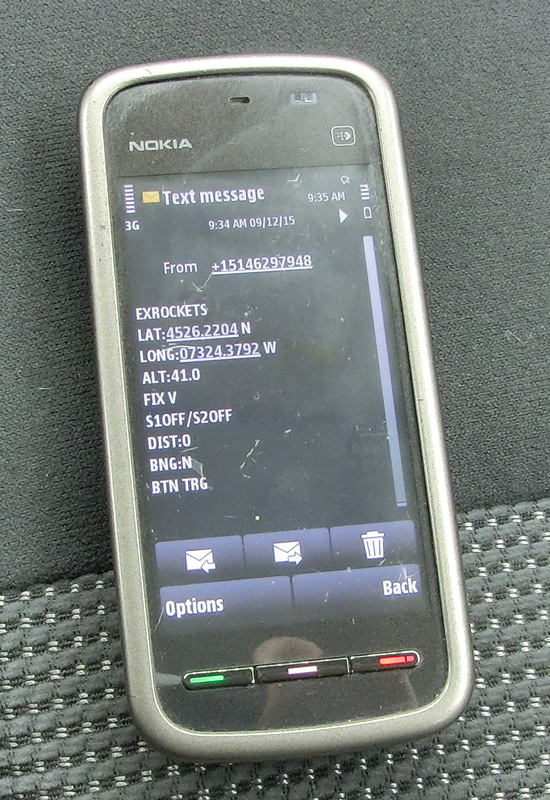 This also can be used as a switch to receive impulses from external devises that will trigger SMS messages. Those are power outputs that are connected directly to the battery input and have MOSFET transistors acting as switches. When switched on they can conduct up to 40Amps current for short periods or 8Amps continuous current. Their usage can vary and it is up to the imagination of the constructor. Some examples are: firing the parachute, breaking the parachute robes if the wind is taking the rocket too far, igniting smoke signalization, giving periodic audio and visual signals, powering breaking the power to external circuits at will etc. 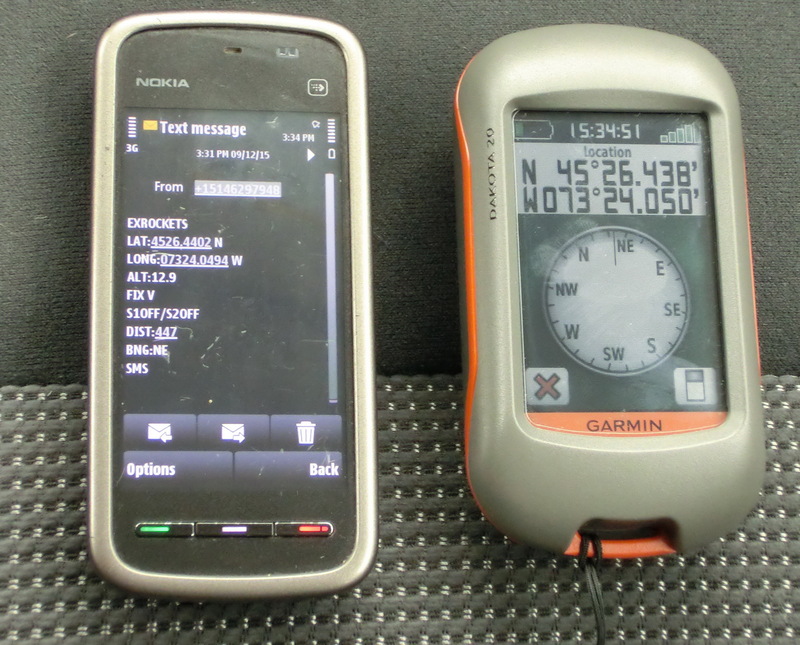 TEST FOR ACCURACY OF THE ALGORITHM FOR CALCULATING THE DISTANCE AND THE BEARING BASED ON THE GPS COORDINATES – the pictures show the start position, the current distance, bearing and coordinates. Finally I am attaching the PCB manufacturing files that can be used to order the printed circuit board, the board firmware that can be programmed with any PIC programmer and the PC software. 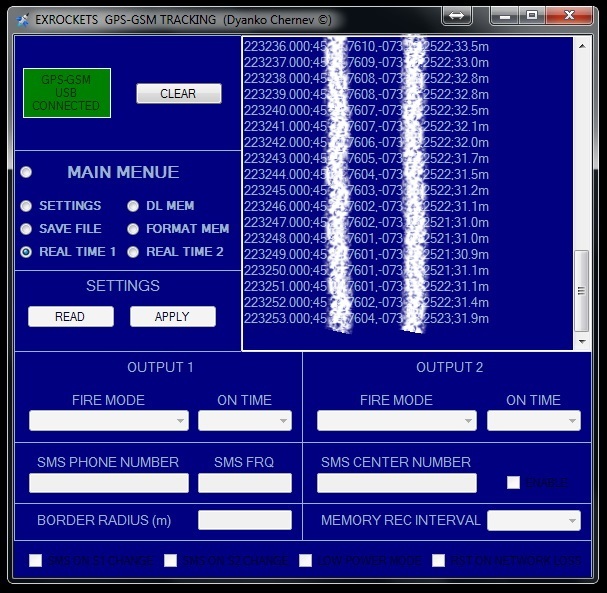 The software program is the same as in my previous tracker and you can use it for the both trackers, however the firmware has some differences. 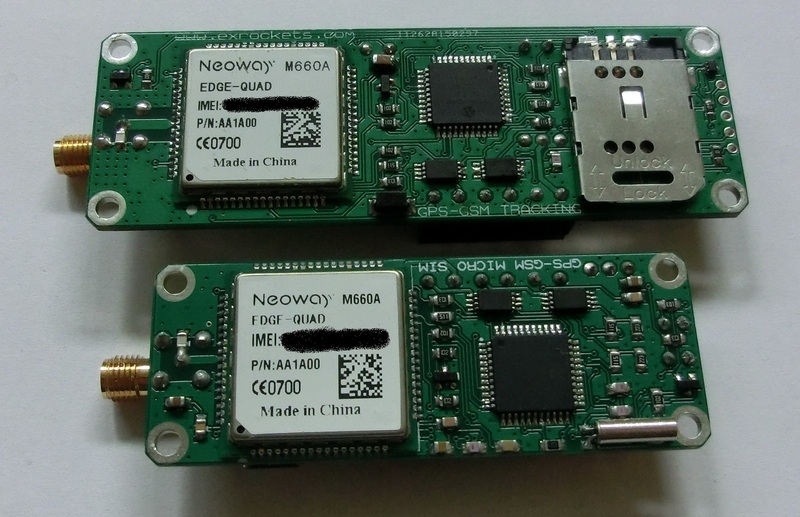 Recently bought new batch of the cheaper NEOWAY M660A modules. It looks like that in this version of the module firmware there is no auto-bauding function whereas the first NEOWAY M660A module that I received had this function implemented although nothing was mentioned about it in the datasheet. However the SIM900 module has the auto-bauding function described in the datasheet. So as a consequence after powering on both modules default to the initial 115200bps baud rate but, this version of the NEOWAY M660A can’t “automatically” switch to the lower 9600bps baud rate. Simple solution was to write small subroutine in the firmware of my device that sends at 115200bps an instruction to the module to switch to lower baud rate. So if it happens that you have a NEOWAY M660A module and your device doesn’t send SMS you need to use the designated firmware that I uploaded (this firmware also works with the SIM900 since both modules accept the manual baud rate setup). The hole world is searching for good-price gsm sms module like this! But I think there is no store to buy it, or? We had 3 bikes and I like to set them up with this great device. this is not a commercial but a hobby project, so unfortunately I don’t sell these devices. amigo, teria como manda o projeto ? estou querendo aprimora para a uma escola tecnica para alunos ! I am sorry but I don’t speak Portuguese.